SIIG's CyberSerial Dual PCIe is designed to add two 9-pin serial ports to PCI Express-enabled desktop computers. 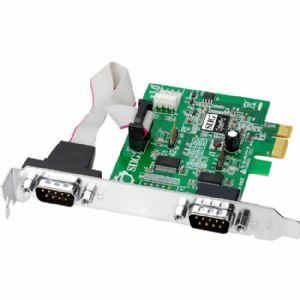 This PCIe serial adapter comes with two high-speed 16950 UART serial ports to support baud rates up to 15 Mb/s, and its built-in 128-byte buffers dramatically increase data transfer rates especially under Windows' multi-tasking environment. The serial port can work as either a standard RS-232 port, or can be configured with 5V/12V power output for devices that require power such as handheld scanners, table scanners, POS displays, etc. The CyberSerial Dual PCIe features a 4-layer PCB (with separate layers for data and ground) to greatly reduce signal noise and loss. Additionally, this dual profile serial adapter works with PCI Express slot with different lane widths. With the included enhanced bend-resistant, low profile brackets, the CyberSerial Dual PCIe can be installed in either standard height or low profile systems providing secure connection to the system.